We Have the InkJecta in a Range of Fun Colors! 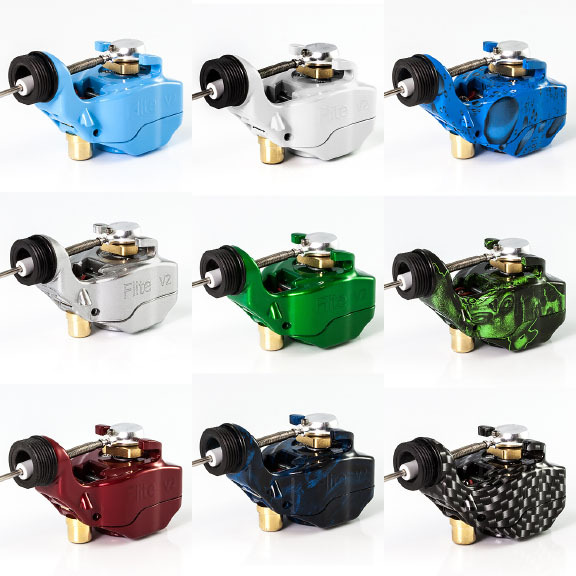 In my excitement to talk about the new Galaxy edition of the powerful InkJecta tattoo machine, I forgot to mention that we also have a bunch of other models in a variety of colors and finishes. If you missed my earlier mention of this machine, the InkJecta Flite V2 is the machine that I've been using exclusively for the past year and a half. As much as I appreciate my extensive collection of classic machines, the Flite has provided me with too many benefits to ignore including the amazing light weight, uniform reliability and some of the most consistent healing of my career. You can check out a video that I made about this machine when we first started carrying it if you want to hear more about why I've been so enthusiastic about it, or take a look at the @inkjecta profile on Instagram to see some of the work being done by the broad variety of top level artists who are using it. We only have a few of each of some of these colors, so take a look now in our online store while we still have this great variety available.